Collagen vascular diseases are a diverse group of diseases in which the body reacts against its own tissues, often causing joint pain and inflammation, fever, rash, fatigue, and difficulty swallowing. Collagen vascular diseases have been recognized for a long time. Rheumatoid arthritis is a chronic inflammatory * disease that causes stiffness in the joints (places where bones meet), and can lead to disfigurement. It is an ancient disease; bone changes showing this condition have been identified in skeletons thousands of years old. Systemic lupus erythematosus (er-i-thee-ma-TO-sis), which affects multiple organs and tissues throughout the body, was first described in 1828. Collagen vascular diseases, sometimes called connective tissue diseases (CTDs) or autoimmune diseases, cover a wide array of disorders in which the body's natural immune or self-protection system fails to recognize its own tissues and goes on attack against itself. Some of these diseases limit their damage to a single organ, and others spread problems throughout the body. In a healthy immune system, antigens (foreign bodies such as viruses and bacteria) are recognized as different from regular body tissues. When an antigen enters the blood-stream, it triggers the production of antibodies, substances that attack the alien substance. Lymphocytes (LIM-fo-sites) and leukocytes (LOO-ko-sites) are the special white blood cells responsible for creating these antibodies. Lymphocytes include two subtypes (T cells and B cells), which have the unique ability to recognize the invading alien and alert the immune system to destroy it. The process is highly specialized: different lymphocytes recognize specific antigens and produce antibodies against only that particular antigen. In collagen vascular diseases, this immune system malfunctions. Rather than responding to foreign antigens, the body produces antibodies (autoantibodies) against its own antigens and normal proteins. Researchers do not understand what gets this autoimmune process started, but they have a fairly good idea of how it proceeds once it begins. * nucleic acids are the cell structures that transfer genetic information: DNA (deoxyribonucleic acid) transfers information to RNA (ribonucleic acid), which leads to the production of body proteins. 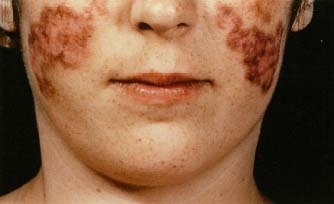 Systemic lupus erythematosus (SLE) may cause a distinctive butterfly-shaped rash on the face. 1993 Custom Medical Stock Photo. including those in the heart, kidneys, and joints. As a result of a faulty interaction between lymphocyte B and T cells, the cells fail to identify a protein as normal, mistake it for a foreign antigen, and then move on to produce autoantibodies called antinuclear antibodies. These antinuclear antibodies attack the nucleus and DNA (genetic material) in healthy cells. Immune complexes are the result of this mistaken battle. When they accumulate in the kidney, blood vessels, joints, and other sites, they cause inflammation and tissue damage. In rheumatoid arthritis, the autoimmune process begins in connective tissue and the cushiony membranes that surround joints and the ends of bones. Collagen (KOL-a-jen) is the tough glue-like protein that gives joints their support and flexibility, and it represents 30 percent of the body's protein. Rheumatoid arthritis is thought to begin when T cells mistake the body's own collagen cells for foreign antigens and alert B cells to produce antibodies to fight the invader. The leukocytes rush in and produce cytokines (SY-to-kines), small proteins that are essential in healing the body but that cause serious damage in large doses. The inflammation and joint damage that result can lead to joint deformities and can spread throughout the body, wherever there is connective tissue. Researchers are studying the causes of autoimmune diseases. Some autoimmune diseases have strong genetic components and may be passed down from parents to children. Environmental factors may act to trigger these diseases in some way. Fatigue, stress, and higher levels of certain antibodies also may lead to these diseases. Even ultraviolet rays of sunlight have been suggested as possible contributing causes. Collagen vascular diseases are not contagious; people cannot catch these diseases from one another. Scleroderma: This progressive and systemic sclerosis (skle-RO-sis) causes skin to thicken and tough fibrous tissue to form in the internal organs of the digestive tract, kidneys, heart, and lungs. Sjogren's syndrome: This causes dry mouth, dry eyes, and other symptoms. Polymyositis and dermatomyositis: These are inflammatory muscle disorders that may also affect the skin, the heart, and the lungs. Mixed connective tissue diseases: These combine features of lupus, scleroderma, and polymyositis. Polyarteritis nodosa: This disorder can damage small and medium-sized arteries of almost any organ, including the kidneys, heart, and intestines. A complete medical history and a physical examination are the basis for the diagnosis of autoimmune disease. A number of laboratory tests can be used to help diagnose collagen vascular diseases. Blood tests can check levels of autoantibodies. Other tests include rheumatoid factor tests, urinalysis, blood counts, liver and kidney tests, and a sedimentation rate, which will give a nonspecific indicator of inflammation. A chest x-ray and other tests of specific lung function also may be done, since collagen vascular disorders occasionally produce breathing difficulties. At present, there are no cures for autoimmune diseases, although some may go into remission as symptoms disappear for periods of time. Treatment depends on the extent of the disease. Doctors may prescribe steroid creams or anti-inflammatory medications to ease discomfort. In advanced cases, immunosuppressant drugs may help lessen the immune system's over-reaction. These serious diseases often require adjustments in activities of daily living. People with rheumatoid arthritis often have early morning stiffness that lasts for about an hour, after which they can go on about their day. Avoiding certain foods, and reducing physical and emotional stresses, also seem to reduce symptoms for some people.